Rogue River, OR (March 27, 2017) – Wagner Meters’ concrete flooring division today announced it is giving away over $30,000 worth of free Rapid RH® products through its “Golden Ticket” Product Giveaway. The 12-month giveaway begins April 3, 2017. 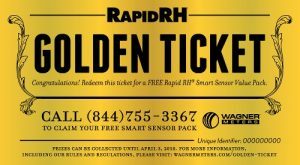 Customers who make purchases of the Rapid RH® sensor packs or the Rapid RH® Starter Kit anytime between April 3, 2017, and April 3, 2018, will have a chance at finding a Golden Ticket. The ticket will allow customers to claim either a 5, 25, or 100-pack of Rapid RH® Smart Sensors, valued at $209 to $2,970. “There will be a total of 42 Golden Tickets available. 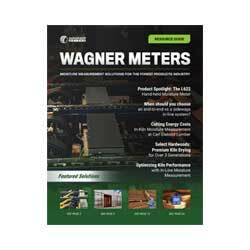 Eligible products may be purchased through our distribution partners or online at www.wagnermeters.com,” says Jason Spangler, Wagner Meters’ Concrete Flooring Division Sales Manager. “These tickets will be inserted within the manual of various sensor packs, so they will not be visible from outside the packaging. The sensor packs housing the tickets include the 5-pack, 5-pack with Easy Reader, 25-pack, and 100-pack. Customers may find a Golden Ticket in either individual sensor packs sold separately or in 5-packs that come with the Rapid RH® Starter Kit,” he adds. To claim their prize, customers will have to call Wagner Meters and mention their ticket’s “unique identifier.” Only one prize will be awarded per customer, per unique identifier. Duplicate tickets will not be valid. The tickets will be distributed nationwide over a 30-day period beginning April 3. The Rapid RH® System utilizes the scientifically proven in situ relative humidity(RH) method for measuring moisture in concrete slabs. It is fully compliant with ASTM F2170 and significantly improves the ability to monitor the drying process of new and existing concrete slabs without adding substantial cost to the project. It’s extremely fast, accurate, and easy-to-use. Wagner Meters is the world leader in manufacturing technologically advanced wood and concrete moisture measurement devices and moisture measurement systems for flooring professionals.